About Another shot taken at our local reservoir. Great shot, David, congratulations on the donor of the day award. This has the perfect composition, colors, subject matter, etc. Nicely done, wish I had some kind of water, port, harbor, etc, etc to shoot. Perfect !!.. I am simply a fan of your work. WOW! Wonderful shot! Great colors..great perspective! Magic light! Congrats on the award! I really like your perspective. This is trully a master piece. I have never experience the problem that you mentioned, but I agrre with Ahmeed, this shot can't be any better. Congratulations for the well deserved DoD. Breathtaking scenary. its an Award winning for sure. Thank you ahmed, I appreciate it very much. Thanks so much for the wonderful compliment! You make me feel....relaxed and happy! Original or not, colors are great> The composition is also very good. Wonderful landscape with amazing tones in the sky! Thanks Chad for the great feedback! Great sunset shot. 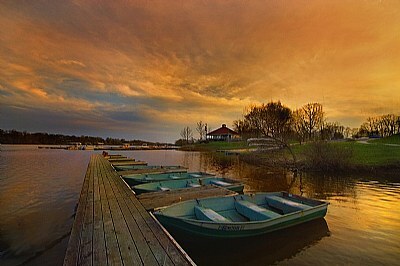 I like the exposure on the boats and the dock, they really stand out from the water. The sky seems to be a little underexposed and flat. Maybe boosting the contrast in the sky would help. But I wouldnt touch the levels on any other part of the photo. In the original the sky isn't quite this orange. For some reason pictures sometimes look a lot different after uploading than they do on my monitor. I understand the difference between Adobe RGB and Srgb, but I still have this problem.